If I don't come back, here's where you're likely to find me. Image by Mike Simms, shared under CC license; image found here. Please remember to come home, doyle. Dingle town and the Dingle pennisula are nice places to explore if you haven't been to them already. I do love Doolin too!! Saw some great music sessions at the Gus O'Connor pub in Doolin. One guy played the spoons perfectly, and a one-legged sailor got up to sing. I miss the music and the way Guinness tastes there! 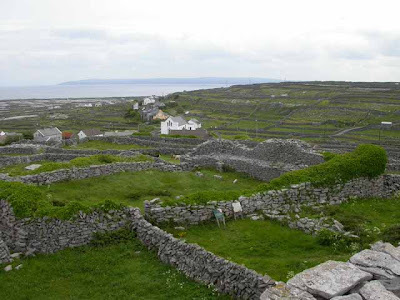 We walked from Doolin up along the cliffs to the more formal visitor center. We trekked through pastures of cows and goats, crawled under barbed wire and electric fences, and avoided the bulls. We also manage not to slip off the cliffs. I brought Yeats along with me, and glad I did--he made sense before, he makes more sense now. That may be age more than geography, but not sure the two are separable. We found a few trees, even on Aran. Hard to grow an oak tree on rock, though. Dingle was wonderful, and the ring of Dingle better yet. Wild country. Gus O'Connor's was fun, but we got lucky in Dublin. We stumbled upon Betty McKenna, and Anthony Kearns (among others) joined the fun at The Celt (on the northside). A magical trip, a wonderful land. I miss it already.